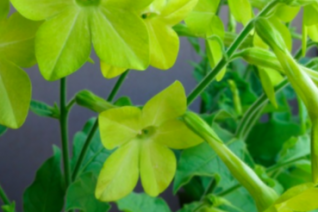 A hardy annual with exciting lime green flowers that are fragrant at night. Full sun to part shade in rich soil with regular water. Blooms May until frost. Remove spent flower heads to encourage more. To 30″ tall. EXCELLENT container plant. Combines very nicely with light blue flowers such as Salvia patens ‘Cambridge Blue’. Reseeds somewhat in disturbed soil. Great en masse. May behave as a perennial in mild winters- above 20°F. Moderately deer resistant.